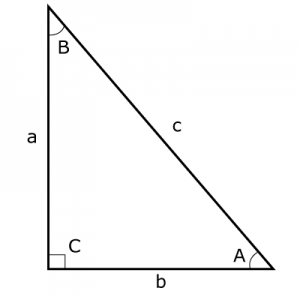 The right triangle is a special type of triangle that forms the basis for nearly all trigonometry functions. As you know, a triangle is a closed shape consisting of three sides. Every two of these sides form an angle between them for a total of three interior angles. These three angles together add up to 180º. If one of these angles is 90º, also known as a right angle, the triangle is known as a right triangle. This is a right triangle. The three angles A, B and C are marked and each side’s length is denoted by a, b, and c. The side length letters are the sides opposite of the angle with the corresponding capital letter. The side opposite the right angle C is known as the hypotenuse of the right triangle. The common method to remember these formulas is the mnemonic SOH CAH TOA. The last three are reciprocals of the first three. The tricky part is to remember cosecant goes with sine, not cosine as the name may suggest. Memorize and learn these relationships of a right triangle. You will see these formulas again as you further your studies in science and engineering.